Google Android One initiative hits Myanmar featuring our very own Cherry Mobile One! 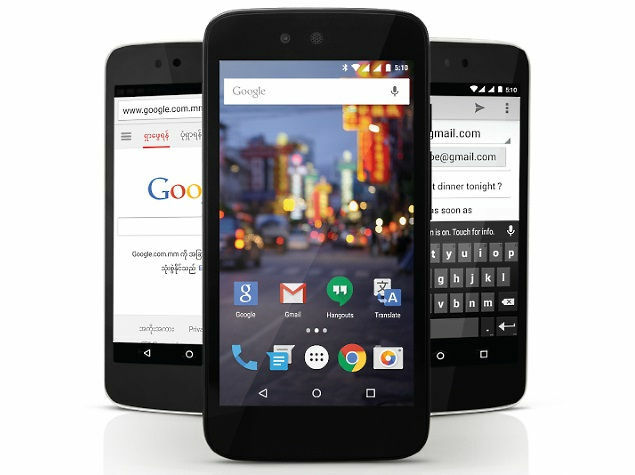 Google Android One initiative hits Myanmar featuring our very own Cherry Mobile One. The device will be having MMK 1,09,000 price tag which is roughly priced at USD 99 or Php 4,460 as of the current exchange rates. Basically, the handset is the same Cherry Mobile One that we have here in the country. It packs a 4.5-inch FWVGA display with 480 x 854 pixels, 1GB of RAM, 8GB of on-board storage and the latest Android 5.1.1 Lollipop. Myanmar is the eighth country to have received Google's Android One program which aims to let the budding markets all over the world experience what Google describes as "great smartphone experience." The Cherry Mobile One was released in the Philippines earlier this year alongside the MyPhone Uno. The handset also packs 5MP and 2MP camera combination and 1700 mAh battery.